We have all seen gardens that were dismal failures! Plants too large and misshapen for the garden beds, hundreds of unrelated statues cluttered amongst a layer of rocks, landscapes that just don’t cut it. Why is it that the same silly little plaster ornaments, very large plants, and totally unrelated items can work in some spaces, while in others they just look wrong? Do you wish you could take all that assorted junk you've got and turn it into an artistically beautiful garden space? It’s all about visual balance. 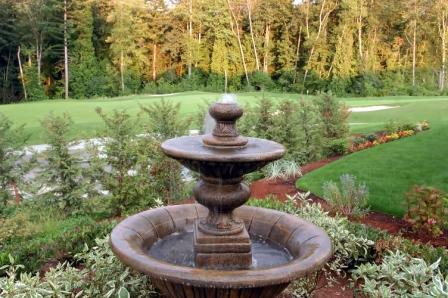 Visual balance is the essence of any successful garden. Ugly things can become beautiful in a balanced garden design. Beautiful things can become ugly in an unbalanced garden. Organization of space, attention to form, color, and value pay off. From time immemorial, some people just “get it” and can arrange things intuitively and succeed. Others of us have to really think about placement of plants and objects to find success. So what are those principles that we use to ensure our gardens succeed? How do you take those unrelated plants and other objects and arrange them to create visual balance? Here are the secrets that designers use to create those beautiful designs. As you will see, they are not secrets at all! With a rudimentary understanding of these visual balance concepts, you can create gardens that capture the heart using just about anything, including that junk pile in your back yard! We love symmetry, us human beings. It is our natural tendency to put two things very alike across from one another. We visually divide any view into “parts” which we have an unconscious expectation will visually balance. When that balance does not exist, it can create for us a sense of displacement or discord. Who knows why we have this innate sense. Perhaps is it the symmetry we find in nature that has caused us to look for this order. Even the most minute life on the planet is ordered in this way. We find it in atoms, in insects, in flowers, in trees. We notice immediately when our world is “out of shape”. Humans have two arms, two legs. Dogs have four legs. All are equally balanced in nature. When we see a dog that has lost a leg, we comment on it, and we may even feel sorry for it. We notice when things are out of balance. So you can see why we need to understand the concept of symmetry. Symmetrical balance is created when like things are placed on “two sides” of a view. In our minds, unconsciously in most cases, we divide a view or picture into two halves mentally. We assume a vertical axis, or dividing line, from top to bottom in the center of our view. Symmetry is placing the same or nearly the same objects on both sides of this line, placing them a similar distance from that vertical axis. Throughout history, in art, in landscape, and in architecture we have seen examples of symmetry. In the example here from the public domain, every element is repeated on both sides, equidistant from the center point. 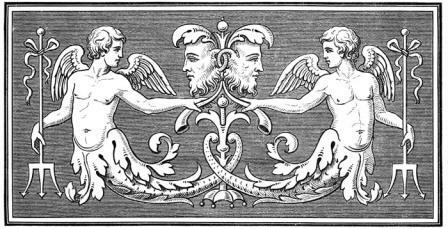 Each element of the engraving is reversed on both sides of the picture, creating a perfectly symmetrical composition. This concept can be applied to the garden as well as seen in this illustration. Here there are two trees, both identical. 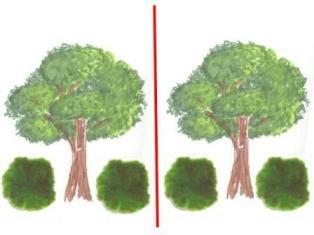 Both of these trees have shrubs placed approximately equidistant from one another on the page. They are identically replicated on one side of the vertical axis line in the center. Notice something about this composition. It can appear very static. Some might say boring! Another design principle we will discuss elsewhere identifies a concept called variety, which can be important in design. For now, let's focus on visual balance. So how does all of this translate to a garden? Let's look at an example of symmetry used very effectively in a garden owned by the National Trust at Knightshayes, near Tiverton in Devon. 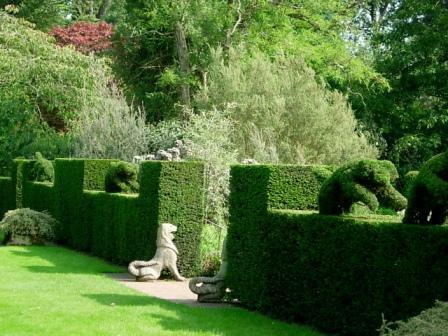 In this example you see a hedge within which topiary has been shaped to depict hunting dogs, with an entrance in the “center” of the hedge on the vertical axis. Notice where the most important element of the composition lies. The entrance to the garden is the focus of this image, even though it is not the “center” of this image. This is because the use of symmetry creates an emphasis at the center point, whatever is in that center position can take on extra importance as a result. This is a very effective use of symmetry to create a visual balance in the garden that manages to avoid a static feeling that can often result from slavish adherence to symmetrical placement. Isn’t this wonderful! It appeals to my sense of the fantastic! I can just imagine the Queen of Hearts marching through this garden with her playing card troops. Not all balance is created equal, as we will see in the next concept. There are many ways to create balance, and not all of them rely on symmetry. In truth, most gardens do not rely on symmetry as the principle spatial organization technique to create visual balance. Many rely on asymmetry, and the vast majority actually rely upon a blend of the two concepts to create visual balance. 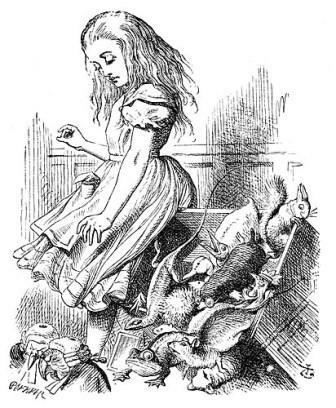 In this wonderful public domain image of Alice growing larger in a scene at her trial, original to the excellent book by Lewis Carrol “Alice in Wonderland”, and drawn by John Tenniel, we see the principle of Asymmetry in effect. By far the largest image in this drawing is Alice, who stands to the left side of the composition and fully dominates the image. Yet there still is a balance to the image. If the vertical axis is drawn over this image, Alice is mostly on one side of the composition. So why does this image still appeal? The concept of Asymmetrical Balance is that the two sides of a vertical axis do not have to be identical in order to balance a composition. So in this case, what causes our mind to accept this image as balanced is that across the bottom of the image, almost halfway up the composition, is a delightful jumble of smaller figures. The black and white image has most of the darker values near the bottom, which also balances the image. Creating visual balance using asymmetry relies upon the use of unlike elements in a fashion that creates “equal weight” upon either side of a vertical (or horizontal) axis. This can be achieved through color, color value, form, shape or size. In the case of this illustration, visual balance is achieved by the use of both form and color value. There are a large number of small forms in the image (animals of the court) and the darkest values of grey and black are all concentrated at the bottom of the composition. This achieves asymmetrical balance. Now let’s look at another version of our drawing. Here we see the same basic shapes as in the symmetrical drawing that we looked at above, but in this example, the composition is asymmetrical in nature. We see a similar arrangement to the composition in the image of Alice in Wonderland. The two trees are now placed to the left of the composition. 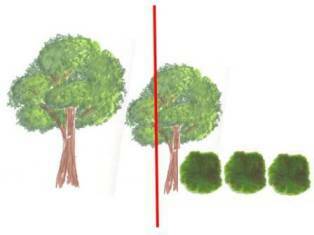 The second tree has been made smaller, and the shrubs are all arranged to the right side of the vertical axis. Still, this composition works, because again, the darker values are near the bottom of the composition and the three smaller shrubs in this case extend farther to the right which begins to place equal visual weight on both sides of the vertical axis. I’ll talk more about the vertical axis and visual balance throughout this website and you will begin to see the variations on this concept that are possible. There are many ways to use color, color values, form, shape or size to balance a composition. For now, let’s see what that can look like in the garden! As you can see in this photo, an asymmetrical composition can be very pleasing to the eye. In fact, at first glance, you might be tempted to call the visual balance in the image below symmetrical, but look closer! In this image, the composition is definitely asymmetrical. Notice that on both sides of the image, vines are growing against the wall. This is what fools the eye into believing that this image is symmetrical. But notice! The two vines are different. The vine on the right is larger leaved, with more visual interest in the form of seed pods and flowers, while the vine on the left is smaller leaved and uniform. There is more! Notice where the table and bench are placed? Are they placed on the center axis? Not really, are they? Yes, both cross the center vertical axis, but they are not centered upon that axis. Notice that the composition is extended to the right by another matching garden bench. 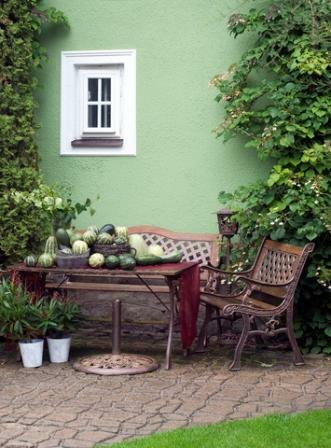 The patio is on a diagonal with most of the visual weight resting on the left, and there are a number of squash and gourds from the garden arranged on the table. The shadows, or darker color values, are concentrated near the bottom of the image. Yet this is a very pleasing, balanced image! This is an example of asymmetrical balance at work. This same concept works as well in the garden as it does in the image of the garden above. Have you been flummoxed in the past because you just cannot seem to create an organized and pleasant feeling space? If you have, then be sure to look into whether or not you have successfully created a balance in your garden! You will likely find that this is the primary issue. These simple organizing concepts will make the difference between success and failure with a garden space. It does not matter how beautiful or expensive the garden elements are, if visual balance is missing, the space will feel either static or discordant! If you are still unsure of these concepts, pay attention to garden spaces around you for a while. Notice what elements work together to create a balance within the space. Is it size? Is it color? Is it form? Or is it one of the many other characteristics that can be manipulated to cause your visitor to see a balanced space? Be sure and check out some of the other design concepts we've reviewed, as many of them are tools to help create visual balance in your garden! No more garden failures for you! 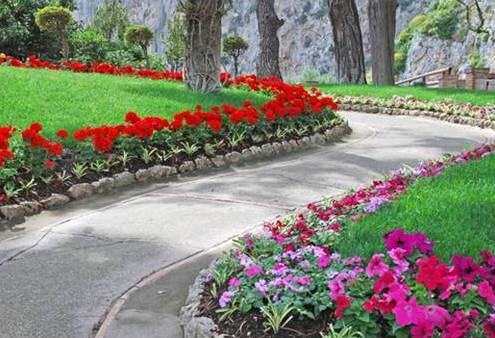 Use these "design secrets" to easily create YOUR OWN magnificent garden spaces!